The chilblains are back - gutted! I thought I was doing so well and that buying my woolly slippers and socks would keep them at bay but it clearly wasn't enough....grrr.....I've now heard that once you've had them once in a winter season you can just keep on getting them... so lucky me! Apparently it's 4 days and 9 hours till a certain person in the house's 9th birthday - don't worry we're getting regular updates so we can't forget how long it is! Speaking of birthdays.... a couple of weeks ago Noah decided that it was his monkey's birthday that day and he wanted to make fudgy banana muffins for the occasion. 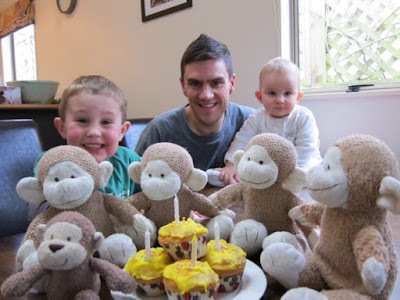 Lo and behold I was then reminded by Facebook that night that it was exactly 5 years ago to the day that we'd dreamed up the idea of monkey having a birthday - how FREAKY that Noah picked that exact day - especially as we'd never mentioned it since! I went to my first ever live netball game on Sunday night with lovely Jackie and my mum - the Silver Ferns beat South Africa quite convincingly. I was struggling not to fall asleep for most of the second half - not because it was boring - I'd had a late night the night before and Sunday nights are usually a wind-down so think my body was trying to tell me it needed to rest before another busy week ahead. We made a flying visit to New Plymouth during the school holidays - heading down and back within the same day on a wet, wet weekend. It's something we could never have contemplated from Wellington and I know Gee Gee really appreciated the effort we made to see her but boy was driving home in the dark in the worst rain I've ever driven in a scary experience! It was like someone had turned a firehose onto the windscreen at points! Thankfully we made it back in one piece. We had one of the only power cuts I can remember in a very long time the other night while Mark was dropping Noah at Cubs. Mylo was pretty freaked out by the whole experience as he'd not had it happen at night while he was home. I was pleased we had a few candles and torches on hand - we managed to shower in the near dark (the one plus point of having a mains cylinder) but all the washing up from dinner had to wait and poor Mark ended up eating a cold dinner when he got home as he couldn't heat it up again in the microwave! In the end we only had to wait 2.5 hours for the power to be restored but it was a LOOONG time when we had so much to get ready for the day ahead and to tidy up after dinner! We've been making good use of our outdoor bedroom here at the rental already and have had both my cousin Gwyl and wife Charlotte to stay as well as our great friends Jackie and Heidi in the past month, as well as an overnight flying visit from Nate on his way home from the UK too. It's been so lovely to share all the things we love about our new environment with others too including plenty of visits to the section where our new house build will be. Visits to the local Lilypad Cafe and Punnet Cafe went down a treat with us all too! There was even time for a game of Trivial Pursuit - it proved quite challenging for any of us to remember what was 'current' 11 years ago when our version of the game came out though - not helped by the fact that Jackie and Heidi are also 10 years younger than us too - ha ha! The boys also enjoyed showing the girls around their school and took Heidi on in a game of giant chess. After a month without a dining room table, we have been loving eating back at a proper table with this gorgeous new table we bought from Vast Furniture. We sold our other table with the house as we knew it wouldn't easily fit in the rental or the new house and took the opportunity to brighten up the decor with some colourful aluminium chairs to accentuate the colours in the new table. Can't wait to see how they look in the new place too! And on the subject of the house.....we are just waiting for the title to come through - if it all goes to plan the build might actually start late August or early September which would be super exciting if it happens - fingers crossed - it could mean we might squeeze into the house just before Christmas but we are trying not to get our hopes up too much and leaving the timing in God's hands. He's worked everything out pretty SWEET so far so have to give him the opportunity to do it again!